Hamburg were relegated from the Bundesliga for the first time in their history on Saturday, as a 2-1 win over Borussia Moenchengladbach proved too little too late. A proud run of 55 season in Germany’s top flight came to an ugly end, as Hamburg fans set off a flurry of fireworks, releasing a cloud of black smoke across the Volksparkstadion, forcing play to be suspended just minutes from time. The six-time German champions, who won the European Cup in 1983, are the only team to have played in every single Bundesliga season since the league’s inauguration in 1963, earning them the nickname “dinosaur”. 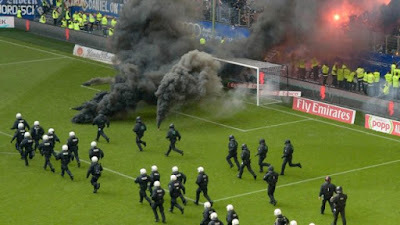 Hamburg had battled to victory over Moenchengladbach, but were doomed to relegation as Wolfsburg beat Cologne 4-1. The day started disastrously for Hamburg, as Joshua Guilavogui fired Wolfsburg ahead in the opening minute against Cologne. In Hamburg, Aaron Hunt put the home side ahead before Josip Drmic equalised for ‘Gladbach. Jonas Hector brought Cologne level just after the half-hour mark with an exquisite chip, but Divock Origi restored the lead for Wolfsburg, edging Hamburg closer to disaster. Lewis Holtby’s curling strike kept Hamburg’S hopes alive, but when Bobby Wood was sent off 20 minutes from time, their fate seemed sealed. Minutes later, Robin Knoche headed in Wolfsburg’s third, and when Josip Brekalo added a fourth in stoppage time, Hamburg’s fight was over. After a 15-minute delay due to crowd trouble, the game was able to end. The famous digital clock in Hamburg’s Volksparkstadion, which displays how long the club have been in the top flight, must now finally be switched off. At the other end of the table, Hoffenheim pipped Bayer Leverkusen and RB Leipzig to fourth place, as they beat Borussia Dortmund 3-1 to secure Champions League football next season. Dortmund goalkeeper Roman Buerki gifted Hoffenheim possession with a dreadful clearance on 26 minutes, allowing Andrej Kramaric to fire the home side in front. Marco Reus equalised for Dortmund after half-time, but goals from Adam Szalai and Pavel Kaderabek fired Hoffenheim into Europe’s elite.